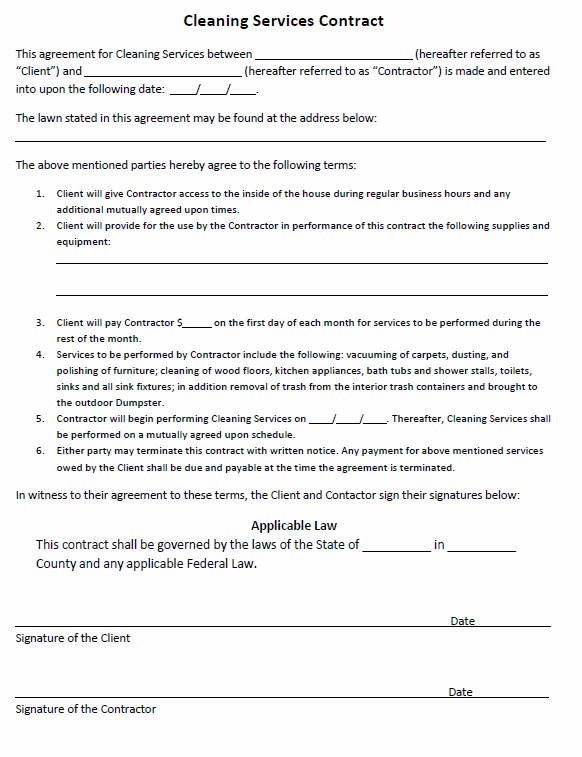 This Cleaning Services Agreement Template is used to make a binding contract between a Client and a Contractor who will provide cleaning services to the client. It is a simple one page agreement, that contains the terms and conditions that both the parties have to follow to make sure the contract is executed without any issues. This contract has details that need to entered, like; the Name of the Client and the Contractor, The date upon which the contract is being entered upon, the address of the lawn that requires cleaning services, the supplies that the Client will provide to the Contractor to complete his cleaning services. The date on which the Contractor will start performing the cleaning services, State and county in which the contract is being executed. The Client will give the contractor access to the inside of the house while the cleaning services are being carried out. The Client will have to provide certain equipment to the contractor to complete the cleaning services. The remuneration that the Client will pay to the contractor in US dollars, on the first day of every month. The cleaning services will include; vacuuming of the carpets, dusting and polishing furniture, cleaning of wood floors, kitchen appliances, bath tubs and shower stalls, toilets, sinks and sink fixtures. The cleaning services will be performed upon a mutually agreed upon schedule. Either party can terminate this contract after giving prior written notice. The client will have to clear any pending payments to due to the contractor at the time this agreement is terminated. This Cleaning Services Agreement is valid only after both the Client and the Contractor have signed this contract. Download this template by clicking on the link below.